Buying a used piano can be tedious because there are a lot of things to consider. The main factors to be considered when you buy used piano; the type of the piano that you need, the condition of the piano, its origin, the maintenance it went through, and the price of the piano — these are all important to make sure that you get the right value for your money. To make it easier for you, here are some tips for buying a used piano and the factors that you should consider. There are several types of piano that you can choose from. But, before you choose, you should know why you need a piano. Is it for personal use for learning purposes? Is it something that you will be using to perform? Where will the piano be placed? These factors would determine what type of piano you should consider. The grand piano is the grandest of them all in sound and size. Grand piano is also categorized based on its varying sizes such as the small grand, baby grand, medium grand, living room grand, professional grand, drawing room grand, parlor grand, semi concert grand, and concert grand. Sequentially, the size also influences the length of the strings and the quality of the sound. While the upright piano has distinct types like the spinet, console, and studio. If you have already decided which type you will get, you should consider the factors that would affect the functionality of the piano. The condition of the piano is very important when buying a used piano. Make sure to schedule a physical inspection of the piano. Make sure that the keys and strings are still intact, the frame should still also be durable — otherwise, it might break down sooner than you expect. Check also the pedals if they are not stuck and working properly. If the piano has been stocked, a little dust may be reasonable, but you should know why it was stocked. 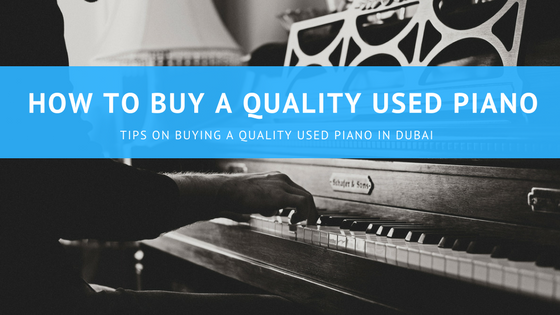 You wouldn’t want to buy piano in Dubai that has been abandoned on a basement that might have been flooded or infested with insects. These factors can affect the overall condition of the piano. Most importantly, you should check the sound of the piano since this is the main purpose of the instrument. The origin of the piano should also be considered if you wish to buy a used piano. Is the seller the owner of the piano? Is the seller the first owner of the piano? With these questions, you can derive whether the piano is a has-been or if it is likely to be still useful to you. You should also try and know who used to play the piano — it is also something to note because a real pianist will be mindful of the condition of the piano that they use. Taking the origin of the piano into account is one of the valuable tips for buying a used piano because you will have some details on the history of the piano and how it has performed before. With this, you will also have an idea how it will be operating once you decide to purchase it. Apart from its condition, its maintenance is also something that you should consider. You should ask the seller how often the piano was tuned. You should also know who performed maintenance and the types of maintenance done on the piano. Or better yet, consult with a piano technician, with this, you can find out if the mechanisms of it are still in decent shape or if not; they can be repaired at the least. If there are parts of the piano that will be needing minor or major repairs, you should consider including that in your budget — pianos like a grand piano and upright pianos has a different maintenance. The price is also a key factor to consider, you would want to get the best quality that would match your set budget. You can consider yourself very lucky if you find a piano in its top shape for a very reasonable price. Other than its price, consider another possible cost such as any minor or major repairs. Consider if there are parts that need replacement. Research the price of the parts and evaluate if it’s still worth to get the piano regardless of the damages. After weighing the pros and cons, our piano experts at Newfound Pianos Gulf recommend first-time buyers to consult with some piano technicians to assist you with any inquiries you may have in getting the right one. This ensures a worry-free experience because there will not be any drawbacks and hidden costs when you buy piano in Dubai. Read the latest and the freshest news in Dubai!